Garden mums are a popular crop for Massachusetts flower growers and, as with most crops, have their share of production problems. When problems do occur, it takes precious time for plants to recover in time for sale. Each year weather-related production problems challenge mum growers. Here are some situations that have occurred over the past few seasons and how growers responded to correct those problems. These tips may help prevent a problem or two with your crop this season. A garden mum cutting that has initiated a terminal bud will usually perform satisfactorily. These cuttings should be given a hard pinch 4 to 6 days after planting, when the plants are fully turgid. This will force out lower breaks, which tend to be more vegetative. Plants will typically grow well with proper attention to moisture and fertilizer levels. It is important to keep them well watered and fertilized. Cuttings that have initiated lateral buds down the stem will not always perform well. Anything that checks the growth of the cutting may push the plants into bud. Chrysanthemum flower buds initiate easily and develop rapidly, especially if plants are stressed in any way. Lack of adequate water and fertilizer are two common causes for premature budding. Also, when grown outdoors, we are relying on the natural daylength and temperature to control the timing of the crop. Chrysanthemums are short-day plants. Both flower initiation and development of the flower buds occur more rapidly under short days than in long days. 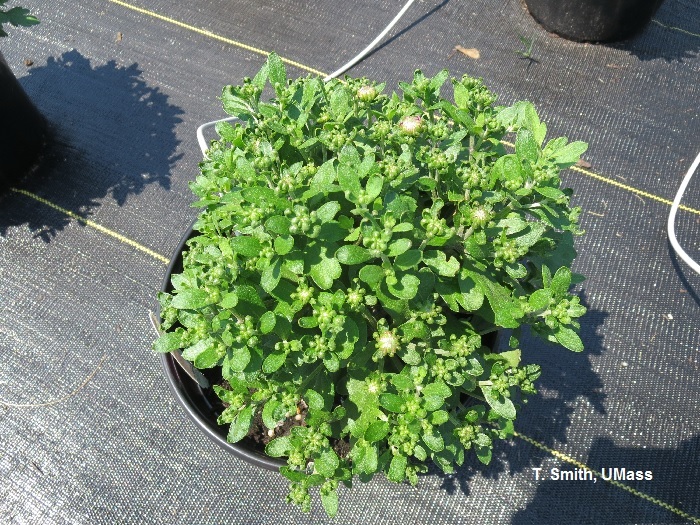 However, temperature has a greater influence than daylength on flowering of garden mums. Here in Massachusetts we can experience very cool nights in June. With several cool nights in a row, garden mums can initiate many buds prematurely which results in early flowering of the plants. Sometimes a period of cool temperatures causes plants to begin the flowering process; however, when temperatures become warm again, flower development stops and the buds fail to develop properly. If premature budding occurs, buds should be pinched off, and adequate moisture and fertilizer supplied. The plants will almost always continue to grow and develop into a quality fall crop. Short plants. Again, short plants are a result of plants setting bud too early. In chrysanthemums, flower bud initiation marks the end for vegetative growth. Garden mums initiate leaves rapidly. Cool weather early in the growing season will reduce the number of leaves formed on each shoot, thereby, resulting in plants with fewer nodes and shorter plants. Another reason for smaller, harder plants may be due to plants experiencing stress due to dryness. Plants must never be allowed to wilt during the early stages of growth. Wilting in the first few weeks of growth restricts branching action and overall growth. Always water-in freshly planted cuttings with a fertilizer solution containing 300 ppm of nitrogen, phosphorous and potassium immediately after planting. The cuttings will establish faster and grow more rapidly. Do not stress the young plants during their first 4 to 5 weeks of growth. Keep plants moist, well fertilized and properly spaced. This is even more important during the first 10 days of the crop. Give garden mums "hard" pinches, rather than "soft" pinches. Remove at least ½" of new growth when pinching. This helps to minimize premature budding. Often, only 5 to 7 leaves are left on the plant after the first pinch. Rooted cuttings are usually ready to pinch 10 to 15 days after planting. Situation: Plants fertilized with controlled-release fertilizer, dark colored pots placed on black landscape cloth, temperatures soar for several weeks. Result: Very hot weather over an extended period of time can cause controlled-release fertilizer to release early, burn roots and weaken plants. Soil temperature is a primary factor affecting release of fertilizer from the prills. As the soil temperature increases above 70°F, the rate of release increases. To compound the problem, because there are very few roots, the soil remains saturated for a longer period of time. Once plants are stressed, root diseases take hold and cause a secondary problem. In another situation, when controlled-release fertilizer releases all at once, combined with regular watering, plants recover but plants go from being over-fertilized to being underfed. The controlled-release fertilizer has released but has leached out, leaving plants deficient and hardened. These are scenarios that occurred over the past few years. Many growers use controlled-release fertilizers without a problem. If plants are overhead watered and drip irrigation is not an option, then controlled release fertilizer may be the only solution. A split application of the controlled-release fertilizer should prevent two problems. It should prevent high soluble salts resulting from the fertilizer prills releasing fertilizer prematurely and it should prevent lack of feed due to fertilizer being leached once it has released. Growers having a drip irrigation system may consider using a combination of half the rate of controlled-release fertilizer and supplementing with 50% liquid water soluble fertilizer or using 100% water soluble fertilizer. A monthly soil test should be conducted to monitor and adjust plant nutrition. Another problem that occurs is overwatering especially during periods of hot weather, which encourages root rot. Lift the pots and check the roots periodically. If the pots feel heavy and the soil is saturated, do not irrigate, even if it is hot. However, do not allow plants to wilt prior to watering, especially during the early stages of growth. If plants are allowed to wilt on a regular basis when controlled release fertilizer is used, the roots may burn and root disease will occur. Check the plant roots, especially slower growing varieties. The roots tell a lot about plant health, many times before the top growth shows symptoms. Garden mums grown too close together will be tall, but poorly shaped. Space pot to pot until the first pinch then move to a final spacing, depending on variety. Space so plants barely touch each other at the time of flowering. Eight-inch pots and nursery containers used for fall sales can be spaced on 18- to 24-inch centers. Garden mums grown too close together may develop a "stove pipe" appearance. Common diseases diagnosed in recent years have been root rots caused by Pythium and Rhizoctonia and bacterial leaf spot (Pseudomonas cichorii). Fusarium wilt occurs when cuttings are infected or soil is contaminated with the pathogen. Leaf spots caused by Alternaria, Botrytis and Septoria are not common on mums but occur ocassionally. White rust (Puccinia horiana), also not common, has shown up in the Northeast in recent years. Mums suffering from root diseases will often look nutrient deficient and they are, considering the roots are not functioning correctly. Plants with root rot often look stunted, wilted and have veinal reddening even when adequate nutrition is being applied. Fungicide drenches for root rots include, thiophanate methyl & etridiazole (Banrot) for Pythium and Rhizoctonia; mefenoxam (Subdue MAXX), etridiazole (Truban) propamocarb (Banol) for Pythium; and fludioxonil (Medallion), thiophanate methyl (Cleary's 3336, Fungo Flo) or iprodione (Sextant) for Rhizoctonia. Fusarium is a vascular disease that develops within stems. Fusarium wilt results in symptoms similar to root rot but plants infected with Fusarium generally wilt in sectors, or one branch at a time and roots often appear healthy. Root rot usually results in the entire plant wilting. In later stages of Fusarium wilt, a white or pinkish fluffy mold may develop on the affected stems. Managing Fusarium centers on disease-free cuttings and pathogen-free root media. Thiophanate methyl (Cleary's 3336) and fludioxonil (Medallion) have been reported to suppress Fusarium. Bacterial leaf spot, caused by Pseudomonas cichorii often occurs during hot humid weather in August. This disease tends to be problematic during years of heavy rains or where overhead watering is practiced. Plants with this disease have large black spots concentrated at the base of the plant. The spots often begin at the leaf margin but may also occur randomly. From the leaf, the bacterium can move through the petiole and into the stem resulting in a canker. The sepals of infected flower buds will become brown to black and up to several inches of pedicel may be killed. Copper hydroxide sprays such as Kocide 101 77 WP or Phyton 27 will help protect against this disease. These materials do not cure the disease, they limit spreading to uninfected plants. Also there are differences in cultivar susceptibility. Make notes when you see susceptible varieties and avoid growing them in the future. Alternaria, Botrytis and Septoria can be managed using thiophanate methyl (Cleary's 3336), iprodione (Sextant), chlorothalonil (Daconil Ultrex, Pathguard 6F), chlorothalonil & thiophanate methyl (Spectro 90 WDG) or fludioxonil (Medallion). As the plants grow rapidly in August and develop a dense canopy of leaves, treatments may be necessary. White rust (Puccinia horiana) is a federally quarantined pathogen. Look for white to yellow spotting on the upper sides of the foliage with corresponding pustules of white spores which look bumpy on the undersides of leaves. Cooler weather conditions in fall tend to favor this disease. Although not a common disease, be aware of it. Materials used to protect against rust contain chlorothalonil (Daconil Ultrex, Pathguard 6F), mancozeb (Dithane T/O), azoxystrobin (Heritage), trifloystrobin (Compass), propiconazole (Banner Maxx) and triadimefon (Bayleton). Bacterial leaf spot and foliar diseases are spread by splashing water, which is why we see more of these diseases during rainy years. Drip irrigation helps to prevent foliar diseases. If overhead watering, foliage should always be dry before evening hours. To prevent problems this mum season, get plants off to a great start. Adequately fertilize and water, monitor media pH and EC throughout the growing season and make fertilizer adjustments when necessary, avoid overhead watering late in the day and regularly check the roots and plants for signs of disease and pests. By taking the time to monitor your crop you will save time, money and aggravation. Burns J. 2003. Steering Clear of Mum Troubles. Long Island Horticultural News, Cornell Cooperative Extension of Suffolk County. July issue. Erwin J. 2002. Garden Mum Production. University of Minnesota, MNLA Minnesota Commercial Flower Growers Bulletin. July issue. Han S. and T. Smith. Garden Mums '92. Floral Notes, University of Massachusetts Extension. 5(2): 4-5. Smith T. and P. Lopes. 1999. Garden Mums: The 1999 Season. Floral Notes, University of Massachusetts Extension.12(3): 8-9. Fact Sheet 2008: Chrysanthemum White Rust. University of Massachusetts. Yates, R. 2012. Garden Mums from Cell Paks. Griffin Greenhouse Supply Company.